One of the very proponents of an American Indian Day was Dr. Arthur C. Parker, a Seneca Indian, who was the director of the Museum of Arts and Science in Rochester, N.Y. 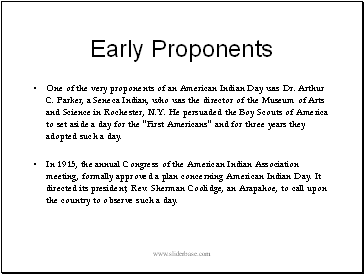 He persuaded the Boy Scouts of America to set aside a day for the "First Americans" and for three years they adopted such a day. 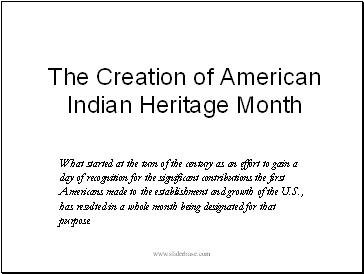 In 1915, the annual Congress of the American Indian Association meeting, formally approved a plan concerning American Indian Day. It directed its president, Rev. Sherman Coolidge, an Arapahoe, to call upon the country to observe such a day. 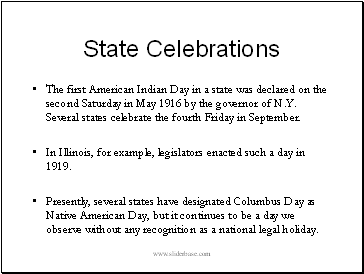 The first American Indian Day in a state was declared on the second Saturday in May 1916 by the governor of N.Y. Several states celebrate the fourth Friday in September. In Illinois, for example, legislators enacted such a day in 1919. Presently, several states have designated Columbus Day as Native American Day, but it continues to be a day we observe without any recognition as a national legal holiday. 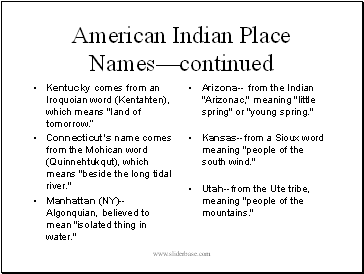 Many American places have been named after Indian words. 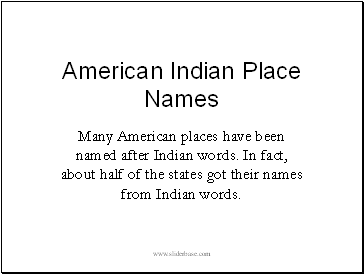 In fact, about half of the states got their names from Indian words. Connecticut's name comes from the Mohican word (Quinnehtukqut), which means "beside the long tidal river." Manhattan (NY)--Algonquian, believed to mean "isolated thing in water." Arizona-- from the Indian "Arizonac," meaning "little spring" or "young spring." Kansas--from a Sioux word meaning "people of the south wind." Utah--from the Ute tribe, meaning "people of the mountains." 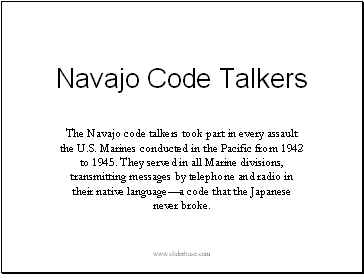 The Navajo code talkers took part in every assault the U.S. Marines conducted in the Pacific from 1942 to 1945. They served in all Marine divisions, transmitting messages by telephone and radio in their native language—a code that the Japanese never broke.